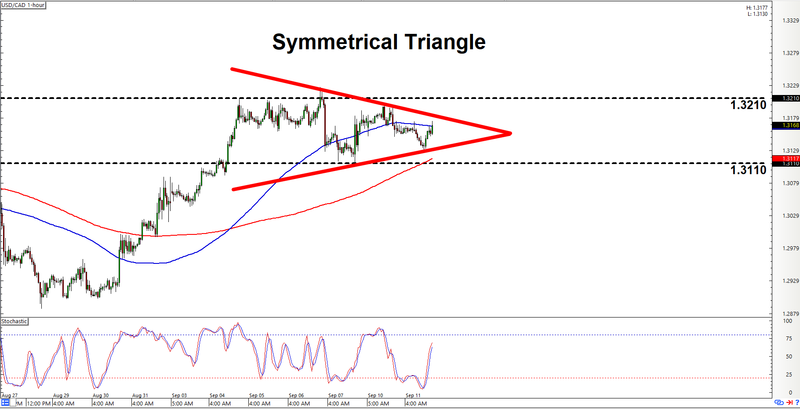 If you’re a breakout chartist, then you may wanna check out the triangle I found on USD/CAD. But if you’re more of a trend playa, then I’ve also got a channel on CHF/JPY that you may like. 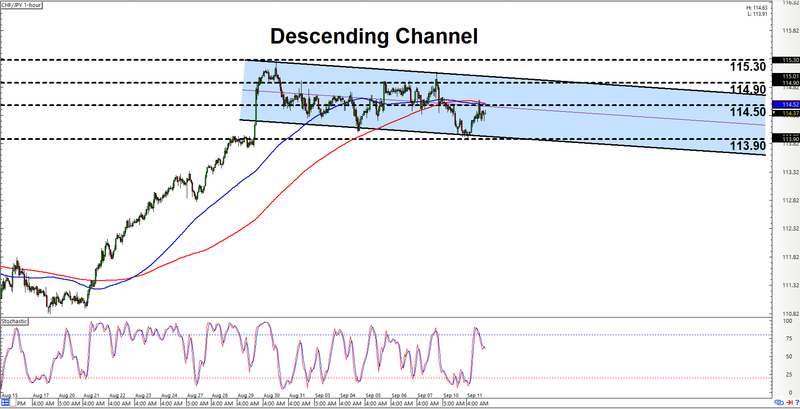 First up is the descending channel on CHF/JPY’s 1-hour. And as y’all can see, the pair is currently moving back up after testing the channel’s support at 113.90. And bulls are likely gunning for the channel’s resistance, which should be somewhere around the area of interest at 114.90. However, there’s a risk that the pair may move back down again since the pair is already hesitating at the mid-channel area, which happens to line up with the 114.50 minor psychological level. And if we look at our technical indicators, we can see that them moving averages are already in downtred move. In addition, both 100 and 200 SMAs appear to be acting as dynamic resistance. Stochastic, meanwhile, is already pointing back down again after visiting overbought territory. Given all that, there’s a risk that the pair may even stage a downside channel breakout. Y’all may therefore wanna plan ahead, just in case the pair moves lower past 113.90. Of course, there’s also always a slim chance that the pair may stage a topside breakout instead. And that’s a feasible scenario since the pair has been trending strongly higher before the descending channel form. Y’all may therefore wanna plan for such a scenario as well. And clearing 115.30 on strong bullish momentum would be an early sign that a topside breakout scenario may be playing out. Fancy a breakout play? Well, check out that there symmetrical triangle on USD/CAD’s 1-hour chart. A symmetrical triangle implies that bulls and bears are fighting it out, but neither side is winning out. However, it’s only a matter of time before the deadlock is broken, which would result in a triangle breakout. One side is just as likely to win as the other, though, so we don’t really have a strong directional bias on the pair. Heck, it would even be prudent for y’all to prepare for both scenarios. But in the event that a topside breakout does occur, then the pair should ideally clear the 1.3210 on strong bullish momentum. Otherwise, the risk remains high that the breakout may fail and end up being a fakeout. As for a downside breakout, that should ideally smash lower past 1.3110 in order to confirm the breakout move. Whichever side the pair breaks out of, the pair will likely have enough momentum for a 100-pip move. In any case, y’all just make sure to practice proper risk management as always, a’ight?